Русская версия страницы доступна здесь. Circle is the audio player for OS X that allows you to stream music, similar to Spotify, but completely free of charge. Free VK account is the only thing you need to enjoy free music with Circle on your Mac! Warning: Because of many requests we changed the app distribution scheme and added the new way to get it – downloading directly from this site. * You can get new version of app much earlier than the App Store users! Because of Apple’s policy regarding app distribution (all the application hosted by App Store must be sandboxed) and totally absence of Public API that allows to recognize multimedia keys pressing, it is impossible to use multimedia keyboard support in Circle directly. But you can use special agent for Circle – the additional micro application that holds in your system tray silently and transmits multimedia keys pressing to circle. You can download that agent directly from here. To install app just move it to your application folder. Hello and thanks for the great App. Can you make it possible that I can make the shortcuts Play/Pause, Next, Previous myself? Because I have a windows keyboard and only the Play/Pause(F7) key is working with your Circle Extension, but Next(F8) and Previous(F6) is not working. Make it possible that I can make the Mini Player “always on top”. Because it’s annoying.. it always disappears, when I’m on another application and I want to switch fast to another song. Or what would be better, if you integrate Circle in the menubar. So when I click on the icon of the circle app in the menubar, it shows me what is right now playing, my other songs and a searchbar to search fast for a song. Look at the application “Music Tab for VK” in the AppStore and make it like the app. Then your app would be great and better then all other apps! Make it possible that I can choose songs, which I want to hear offline. So I don’t want every song I hear to be downloaded, just the ones that I put as my Favorites. It would be cool, if I could choose a folder, where I want to store my favorite songs and so I could use your application offline and listen to my stored/downloaded music. 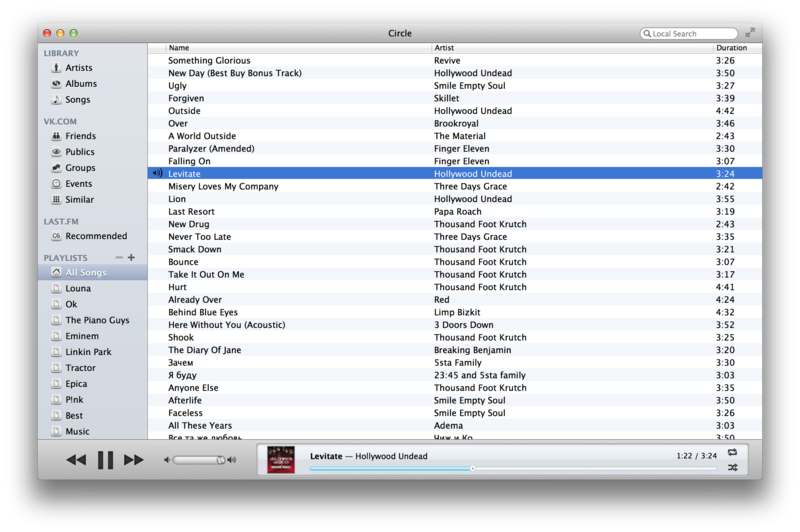 So when I’m offline just show me the songs, that I have stored/downloaded on my mac. ** If there is a “legal/illegal” problem with apple, then don’t put this feature in your main app, but upload it as a plugin on your website, so we can download and install it. Create some Skins for the player. This grey looks ok but not very cool. Make a black one like the simfy mac player. Make a new, cool, creative icon. It can still be the circle but use some cooler colors etc. If you make this all possible then your app is the best!! @Danik Nemec: Hi. I’m glad that you’re enjoying my app! Many thanks for your review, you can be sure that I carefully read it and found some ideas very useful. * Regarding the custom keyboard hotkeys – Yeah, pretty good idea, I will try to implement this soon. * Regarding the possibility of making mini player window always on top – Ok, will be done. * Regarding the other features, especially about new icons and skins – I agree, It would be very nice, but I’m not a designer (I think I already done my best with the app’s look) and I haven’t any team behind me, also this app is non commertial, so I cannot hire them. And I don’t have a much time, so some features can take a significant time to implement. Thus, I unlikely will be able to implement this in the soon future, until some good guy with good designer skills come to me and provide some help with it. But I definitely will look forward in this direction -). hey, so i downloaded the app earlier today but it doesn’t allow me to use any of the options such as (sign up). is there a way i can do it otherwise, or am i just utterly screwed? @Adolfo Angeles: Hi! Unfortunately, the app doesn’t support sign up process yet, but you can register new account on the http://vk.com website directly using your webbrowser. Also, because of the bug found on the vk.com auth webpage last week, the application will ask your for log in every time on launch – please just ignore this and press sign in button without filling anything in the login/password fields (but be sure that you successfully logged at the first time). I know it is a stupid workaround, but It’s all I can do for now. Anyway, I submitted a new version to App Store without this problem, but it will take about a week or so while Apple is reviewing it. I was reading and i saw you don’t have any designers. Do you still need one? Or help with stuff like promoting or so? I would like to help you! Just because I like your app and I’d like to help with your project. @DisparVulgo: Thank you for your response -) I will appreciate any help with my project. I’ve just replied to you with email. Hi! I use Circle Version 1.2 (961) and I think it’s the best VK player, but playback gets stuck on each automatic switch to the next song. Please, fix it! @Nickolas: Hi, sorry for late reply – I’ve been extremely busy. Could you please explain your problem in more detailed way? For example, it would be great if you could provide some screenshots and even console logs captured at the moment where issue appear. Should you need any assistance with it just let me know. blog, Keep up the plasant job. how significantly of the $7 billion it made from advertising in 2013 comes from which streams. You want to look at third-parties for an educated guess.